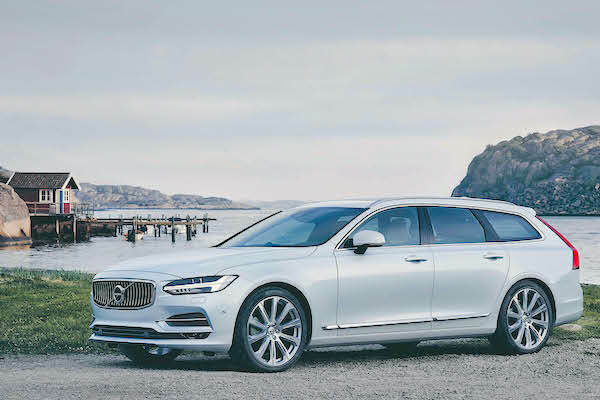 The Volvo S/V90 is the best-seller at home for the first time. It was a schizophrenic year for the Swedish new car market: up 16.5% to an all-time record of 225.543 units half-way through the year thanks to a June frenzy leading to the largest ever monthly volume in Swedish history (66.244), as expected the market has painfully fallen back down to earth over the 2nd half at -31.1% to 128.123 sales, enduring the double-whammy of a new bonus/malus system taxing polluting vehicles put in place on July 1 and the repercussions of the WLTP transition on September 1. As a result, 2018 registrations are down 6.8% to 353.666 units after another very tough result in December (-34.4%), however relatively close to the 360.000 predicted by Bilsweden at the start of the year. Homegrown leader Volvo (-7.4%) loses a smidge of market share at 19.8% as does Volkswagen (-7%) at 15.1% while the best performer near the top is without contest Kia (-0.2%), doubling-down on its surprise 2017 victory over Toyota (-5.6%) by digging a 1.200 unit-strong gap with the Japanese manufacturer this year. BMW (-6.7%) concludes an immobile Top 5 brands for 2018, ahead of Mercedes (-2.6%) whereas Audi (-15.3%) and Renault (-16.1%) both sink. If Skoda (-0.9%) also manages to keep its sales stable, it’s Nissan (+13.7%) that signs the best result in the Top 10 thanks to the new Leaf that has become a lot more affordable with the bonus/malus system. Further down, Alfa Romeo (+100.4%), Jaguar (+72.4%), Lamborghini (+56.7%), Chevrolet (+49.2%), Jeep (+26.8%), Porsche (+18.1%), Fiat (+16.4%), Seat (+11.2%) and Mini (+6.2%) are among the rare gainers whereas DS (-67.2%), Hyundai (-42.1%), Land Rover (-38.2%), Ssangyong (-18.5%), Citroen (-18.1%), Opel (-18%) and Dacia (-15.6%) all lose their footing. 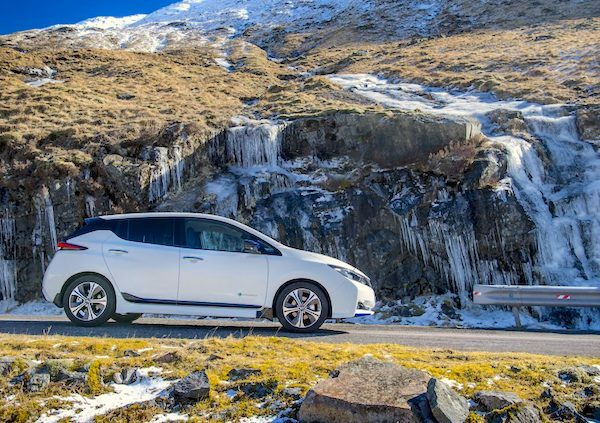 The new gen Leaf lifts Nissan sales up 13.7% into the Top 10 brands. We have a different annual best-seller in Sweden for the fourth straight year: after the Volvo V70 in 2015, the VW Golf in 2016 and the Volvo XC60 in 2017, the Volvo S/V90 launched in 2016 posts its first ever annual victory thanks to deliveries up 7.8% to 6.9% share. In fact, this ends two years of turbulence liked to the replacement of the discontinued V70 which was the Swedish best-seller for 19 straight years between 1997 and 2015. Volvo chose to replace its then top-of-the-range V70 by the more expensive V90 and it took some time for the Swedish public to follow suit but we are there in the end. The VW Golf (-14.8%), Volvo S/V60 (+8.6% thanks to a new model) and VW Passat (-9.3%) all step up one spot ranking from #2 to #4, taking advantage of the deflating of the Volvo XC60 (-44.8%) which owed its historical 2017 win (the first for an SUV in Sweden) to the discounted local sale of the previous generation model. The Fiat Ducato (+18.1%) and Nissan Qashqai (+17.9%) pistoling the largest gains in the Top 10, the VW Tiguan (-0.2%) gains one spot to #6 but the Volvo V40 (-32.1%) due for replacement in 2019, falters. The new Volvo XC40 is inside the Swedish Top 10 in 2018. The most popular newcomer in Sweden in 2018 is by far the Volvo XC40 launched in January and landing directly inside the Top 10 at #9 with 1.7% share. 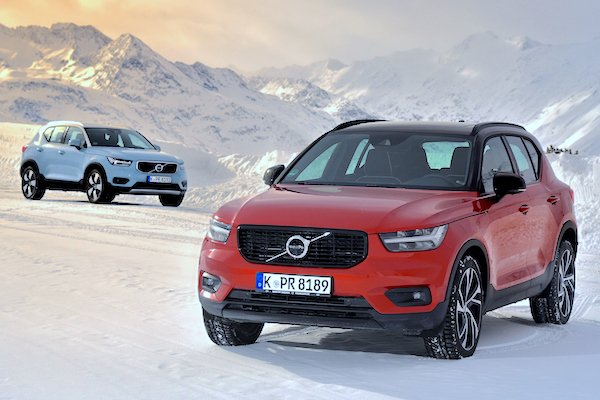 Although Sweden is the only country in the world where the XC40 has managed to break into the monthly Top 5 (in November), that doesn’t mean we can call it an outstanding success. At launch, the V40, deemed a failure at home, posted larger sales: 7.361 over its first 12 months, almost 20% more than the XC40 after the same length of time and a peak during this period at #4 and 4.3% share vs. #5 and 2.4% for the XC40. The V40 ended its first full year of sales at #5 and 3.4% share in 2013 and if we consider 2019 will be the XC40’s “true” first full year of sales – ie devoid of any launch period, breaking into the annual Top 5 might be a tough benchmark to hit, even taking into account the recent SUV craze that has enveloped Sweden almost as much as the rest of the world. Having driven thousands of km in the country over the past 3 years (a Volvo XC40 test drive report is coming soon), my take on this is that the Swedish public is simply enamoured with the large and luxurious vehicle Volvo excels at, preferably station wagons (making them one of the last markets in the world to still buy this format in droves), and have somewhat rejected “dumbed down” Volvos such as the C30, V40 and XC40. Further down the ranking, quite a few green vehicles have benefited from the new tax regime put in place in July, or the arrival of a new generation: the Nissan Leaf (+86.6%), Kia Niro (+59.8%), Kia Optima (+31.2%), Mercedes A-Class (+28.2%), Ford Fiesta (+24%), Toyota C-HR (+19.3%), Audi Q5 (+16.1%), Mitsubishi Outlander (+13.2%) and RAV4 (+13.2%) are among the most dynamic in the Top 50, while the VW T-Roc (#34) and Skoda Karoq (#44) spend their first full year in market inside the Top 50. Very far below the Volvo XC40, the next best-selling all-new launch is the Mitsubishi Eclipse Cross (#119) ahead of the Audi Q8 (#176), Jaguar E-Pace (#191) and Jaguar i-Pace (#212). Full Year 2018 Top 50 All-brands and Top 325 All-models vs. Full Year 2017 figures below. Full December 2018 Top 40 All-brands and Top 240 All-models below.